There are thousands of searches in every metro area in the US of people looking for criminal defense attorneys. We talk to a lot of criminal defense lawyers and ask them all how they get their business. These people have been in business 10, 15, 20 years. Referrals do come in, but business is anywhere from OK to slow. If you really want to know how to get more criminal defense clients, the answer is online. Between 2005 and 2014, the internet went from the least popular option to look for lawyers to the most popular, according to Thomas Reuters research. Those numbers can’t be ignored. How many referrals did you say you get a month? In 2017, the Bureau of Labor Statistics said that the median attorney income in the U.S. was $119,000. Trusting referrals to act as a predictable engine to grow your practice clearly isn’t working, but we’re not just here to sell you on the numbers. 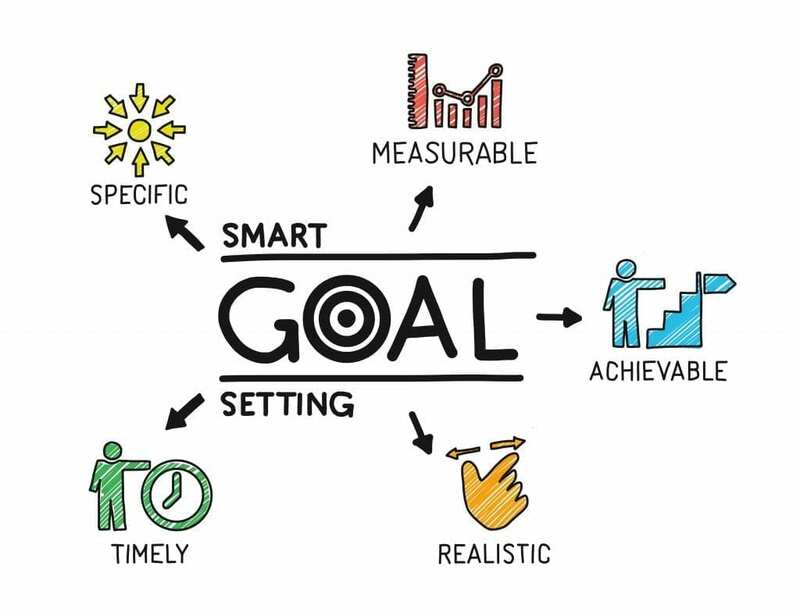 We’re here to tell you how to get more criminal defense clients using a sustainable marketing engine with SMART objectives behind it. A BIG caveat: you probably have already tried digital marketing before and got a “meh” results. Well, I’ve tried playing the piano, and, frankly, the sound was a “meh”. You must hire experts to get this done right for you. Read on to better understand how to get more criminal defense clients and what to expect from the excerpts. Step 1: How to be everywhere on Google? 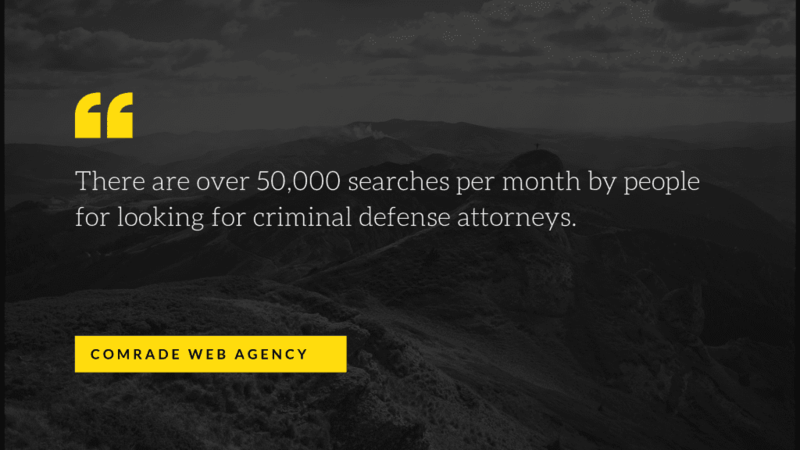 There are over 50,000 searches per month by people for looking for criminal defense attorneys. Of that 50,000, let’s say your metro area accounts for 4,000. How many of those clicks are you getting? Let’s take a look at how digital marketing is used successfully to get you more criminal defense clients. Some of these are action items you can take now, and some you’ll want to farm out to the marketing firm who specializes in working with lawyers to this end. First, if your law firm is not found on page one of Google, the chances of getting a steady flow of new clients are next to none. We know consumers are using Google for 3.5 Billion searches a day, but generally (75% of the time) they go just as far as page one. Now for the HOW to get on page one of Google, and WHERE on the page you have to be. In Google Ads, you can pay your way to the top. If you want quick page-one placement while you work the rest of your marketing strategy, Google Adwords is where you bid for the key search terms you want your sponsored ads to show up for. Work with your web design and digital marketing agency to identify the keywords you should use to attract the right clients. Below the paid ads, the next thing in Google search results are the local map pack listings. The user sees a map of the immediate area speckled with red dots to click for listing details, plus a short list of Google’s “best results” with direct links to those websites. If someone’s looking for local criminal defense attorneys, you need to show up on that map. Your city might have dozens or hundreds of criminal defense lawyers. An easy first step to optimize your local findability starts with your Google My Business page where you can specify your address, areas you serve and more. Nearly 80% of clicks from search go to the organic search results. These are the listings that come below the paid ads and below the map pack. Now for HOW you’ll get there. Read through Steps 2-5 to learn about each of those channels and how to build your reputation, boost your organic Google visibility and get more criminal defense clients along the way. You know about Google, but you might not have ever thought of it as a directory. Well, it is. 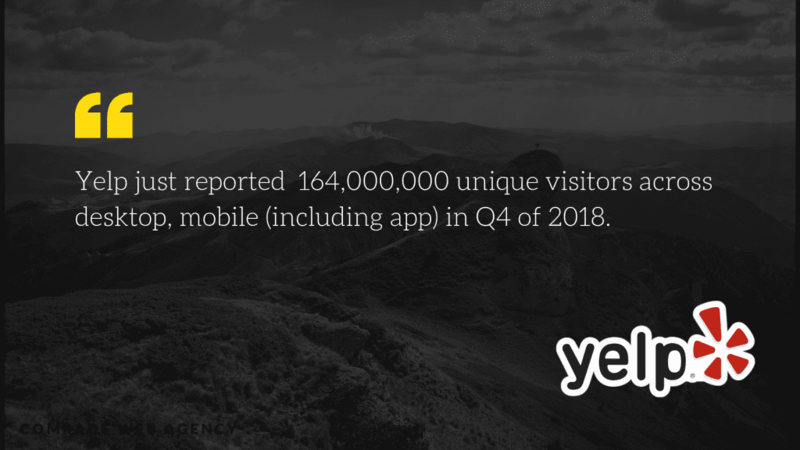 Yelp is another popular directory that just reported 164,000,000 unique visitors across desktop, mobile and their mobile app in Q4 of 2018. That’s a lot of searches being done for everything from restaurants to salons and photographers…to lawyers. In that same Yelp factsheet, we learn that 80% of Yelp searches are done via a mobile device. 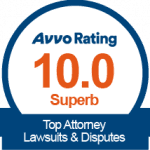 We can assume those numbers are similar for Google reviews, Avvo.com, SuperLawyers, and other attorney-specific review sites. People are searching for you on their phones. And if prospective clients are searching these directories on their mobiles, what do you think the likelihood is that they’re going to click to page two, three or four? Directories are popular because consumers can access a high-volume of service options with the ratings to back them up. Just like people still rely on (and often prefer) family and friends’ recommendations, seeing a list of reviews on a reputable directory is like getting recommendations at high-speed. But users will be browsing these reviews via mobile devices, and they will be quick and decisive about where to click. Your window of visibility is small. First, if you or your firm’s name start with anything after the letter “C” or “D,” or if you haven’t built your review history yet to show up as the highest-rated, without sponsored placement you will be buried and your directory listings will not get seen at all. Second, these directories show up in organic search results on Google, too. 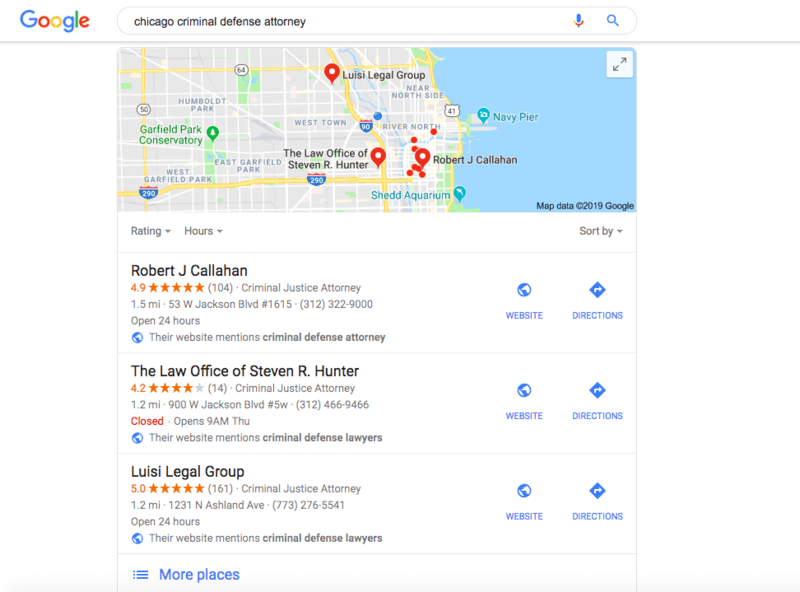 Say someone searches for the “best criminal defense lawyer in Chicago.” They’ll see the Google Ads and the map pack, followed by the organic results. In those organic results, at least one or two of those links will be lists of the “best criminal defense lawyers in Chicago” according to Yelp, Avvo or another one of the other top directories. So you want to be on the first page of that list. If you want to learn more about the benefits of optimizing your directories listings, read what ThriveHive has to say on the subject. YouTube is a crucial piece of your marketing puzzle. There are plenty of reputational reasons why you should be posting videos, but we’ll give you something more quantifiable: YouTube is the second largest search engine in the world. The question is, how do people search on YouTube? And how does that affect law firm internet marketing? Here’s your key concept to leverage: consumers use YouTube to ask questions. Prospective clients who are ready to call an attorney are more likely to use directories and the local results in Google. YouTube, on the other hand, is the platform where your prospective clients are looking for answers to questions around their legal problems. Billions of people turn to YouTube every month to get answers to their questions. So, for your prospective clients who aren’t ready to talk to an attorney yet but who are nervous about their problem and looking for information, you need to have answers ready for them to find on YouTube. First, for the next 30 days, keep a pen and paper by the phone. Write down the questions you get—all of them. Put stars by the common questions and put exclamation points by the ones you think are especially shrewd. Keep on listing these questions out until you have 30, 40, 50 of them. Next, buy yourself a $20 tripod and a $50 mic. Then set your phone on the tripod and record an answer to each of those questions. Then, post your videos to YouTube. 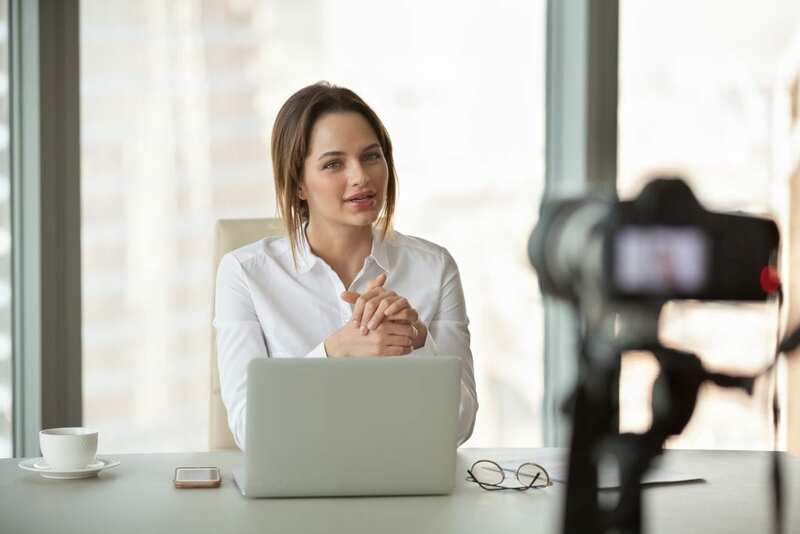 Your digital marketing agency can help you optimize videos with law firm SEO services for higher video ranking, and the whole process can all be streamlined easily. You know prospects are coming to YouTube with questions. And when they find your videos, you’ll personally be the one answering them. Later, when these prospective clients are finally ready to talk to an attorney, you’ll have their attention because you’ve already proven you know what you’re talking about. As demonstrated with directories and YouTube content, there are two groups of “lookers” performing searches online for lawyers in your practice area. And you need a high-performance website optimized for both of these groups and the unique types of searches they perform. We’ll break down the big difference between these two groups below. But first, a definition. What IS a high-performance website? Most attorney websites are underperformers, converting about 1 of 100 visitors. That doesn’t seem too dismal if you compare it to the whole-web average website conversion rate of 2 of 100, but that equally low conversion rate shouldn’t make you feel much better. 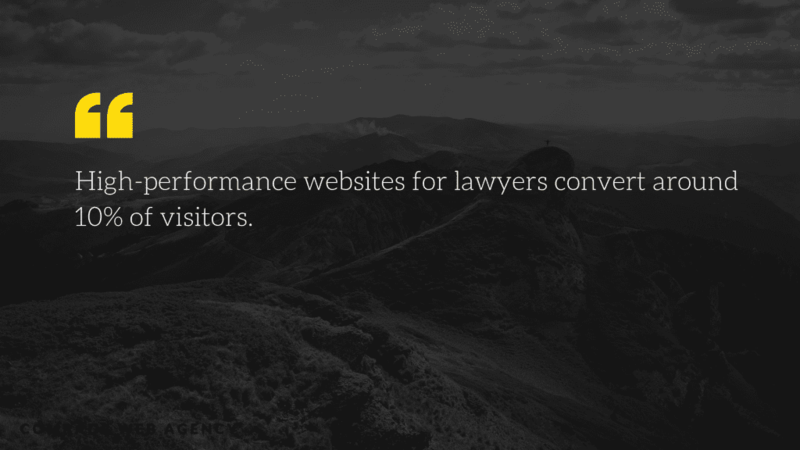 High-performance websites for lawyers convert around 10% of visitors. That’s 10 of 100 visitors filling out your “contact us” form or picking up the phone. Here’s how to create that high-converting website for both of the key audiences you need to reach. This group of prospects is googling things like, “best criminal defense attorney in Chicago.” They’re the prospective clients ready to talk to a lawyer, but they still have to choose which. Let’s say you’ve already executed all the steps above and now you’re highly visible where these prospects are looking (on Google and on directories). Once you get those prospects’ clicks to your website, your site has to meet their needs and convince them that you’re the lawyer they should call. Make it clear you solve the problem they have.If someone is googling criminal defense attorneys, then they’re facing a legal problem and need help. The first thing they need to know is whether you solve whatever type of case they have.Instead of the standard “practice area” tab on top of your website, try listing out “problems we solve.” You can list assault, drug possession, bribery—whatever types of criminal cases you work the most. When a prospective client arrives at your site and sees their issues clearly spelled out, you’ll keep them on the site long enough for step two. Next, offer a case study or reviews to show how effective you are: this is proof that you not only take certain kinds of cases but win them.Some Bar associations may not allow the use of case studies or reviews in law firm internet marketing, but there is an ethical workaround. If this is the case in your state, talk to your digital marketing company about getting directory “widgets” installed on your website. These are small icons that update real-time for Google, Avvo, or any other directory where you have active ratings. Consumers know they can click on these icons to see your reviews and ratings.These are two essential steps to meet those ready-to-call prospects’ needs, but like everything in marketing, there are layers of other tactics and steps. Read more about the 7 things law firm websites need to get more visitors to call [7 Things Law Firm Website Has to Have for More Visitors to Call Your Firm and Ask for Help], because when we’re talking about this first group of prospects, the time is literally now or never. It’s straightforward to think about optimizing your website for those prospects above who are ready to call. But those prospective clients actually make up the minority of prospects visiting your website. This second, bigger audience are those people in need of criminal defense counsel who are NOT ready to call. They’re looking first for answers to their questions because they want to feel more confident about their options before they pick up the phone. Optimizing a high-performance website for this group shares some steps in common with your YouTube content strategy. If these people are asking questions, your first step is to give them answers.Remember that list of questions you crafted and used for your YouTube content? For each of those questions, post an answer on your website blog. And make it a good answer—if prospects aren’t satisfied with the information, they’ll leave your site in a matter of seconds. Answering questions thoroughly satisfies these prospects’ needs and also showcases your expertise. Prospects quickly realize that you know what you’re talking about and that you can help them. 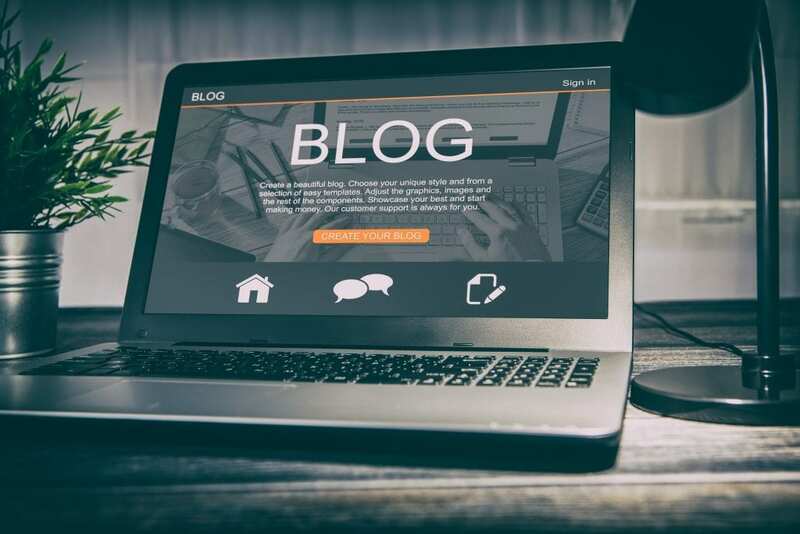 Once you have your blog filled with valuable answers to all the right questions, you then give this audience even more information—but in exchange for something else. These prospects are trying to collect their thoughts and get organized, and they’re under the pressures of a very real problem that they need someone to help them with soon.You can be that someone and give these prospects something before they ever pick up the phone. How? Design a downloadable resource like a checklist or a white paper that speaks directly to the problem they face. Think, “how to choose the right criminal defense attorney” or “the steps in a criminal defense case,” or something similar.Next, have your web design agency install that resource behind a form on your blog that asks users for their names and email addresses. You already know what problems these prospects need information on, so you can imagine what kinds of resources they’ll find useful and will be willing to leave their names and emails for. Finally, you need to know what to do with those email addresses. Your marketing company should set up an autoresponder on your website that sends additional information to the prospects who downloaded your resource. As we said, you already know what problem they face. You even have library-related questions and answers loaded onto YouTube and your website, so following up is a matter of sharing more related information with them from your growing library of answers. By sending these prospective clients more resources and information over time, without any sales pitch, you can win their confidence. You’ll demonstrate your expertise as well as your ethics. And when they are ready to talk to an attorney, the natural choice will be you. The reality for prospects looking for criminal defense counsel is that none of them were ever dreaming of the day when they would need your legal services. You’re meeting clients at a vulnerable and challenging time, and the need for high-value information before they talk to you is essential. This step-by-step guide is your engine to meet prospective clients where they are and give them what they need in a way no one else is doing. Consider this ultimate step-by-step guide to get more criminal defense clients your reminder. There are so many smart marketing strategies that most lawyers are ignoring. Start by reading more of our how-to articles or by giving us a call today.